When last did you play a game that allowed you to fully use your IQ? If you are really interested in such games then you should go for this game “WORD ASSOCIATION”. There are numerous thing about this game that makes it remarkable. This game is really fun and can be played in any group. This game acts as a fast and useful word machine, in which you generate words that are related to the main word raised by the first player. One of the players has to first start with any word and other players will follow suit with by saying words that are related to the first word. The players should be arranged in a circle and it is more reasonable to play the game in a solemn atmosphere so the players can easily concentrate and everyone can be heard. ‍Step 1: The players will secure a serene location and will form a circle. The leader of the game will readout the rules and will make sure everyone understands what they have to do and then move on. ‍Step 2: After the first step, one of the players will have to say a word out loud. The word should preferably be a noun or a word from which you can make other words. After the first player’s word, the next player clockwise will quickly say a word that is related to the previous word. ‍Step 3: The game will continue until somebody goes wrong. A player defaults if he delays for up to five seconds without a response. If a player cuts the connection or repeats a word twice then he is out of the game. ‍Step 4: Eliminated players can only contribute from outside, maybe by helping other participants to find out the mistakes they are making. To participate directly, the eliminated player will have to wait until the game is restarted. 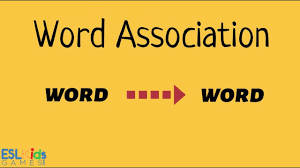 Word Association is a game where that demands you to think fast and efficiently. To win, you have to be mindful of the words you say to make sure they rhyme with the main word. If you are short of words then you will be eliminated and other people will continue. Participants are encouraged to be creative. The game helps in developing IQ and memory. It creates a pleasant atmosphere in which players can! communicate and interact with each other. It helps to improve one’s vocabulary.